Nearly 200 graduate students will present research from a wide range of disciplines at Auburn University’s annual Graduate Scholars Forum Feb. 26-28 in the Student Center. Since 1992, the Graduate Scholars Forum has brought together graduate students from Auburn’s different schools and colleges to showcase the best of graduate research. 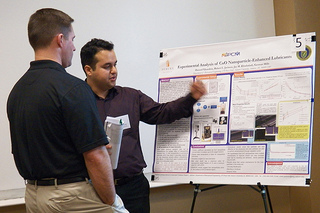 The three-day forum features oral and poster presentations in four categories: Engineering, Humanities, Sciences and Social Sciences. The top presenters will have the opportunity to present in April at the Graduate Scholars Symposium at Research Week, a campus-wide event that celebrates research and creative scholarship. The forum not only serves as a showcase for graduate research, but it is also a means of professional development for graduate students. Jennifer Duggan, executive vice president of the Graduate Student Council and organizer of the Graduate Scholars Forum, said the event gives graduate students invaluable practice communicating highly technical concepts to a general audience.